Lamborghini Aventador broke down when the engine is overheated. 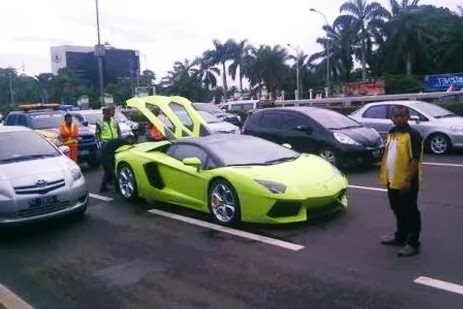 Lamborghini Aventador LP700-4 Roadster jammed in the inner city toll road in Jakarta Indonesia. Green super car broke down while on convoy heading SCBD of Kelapa Gading Jakarta. The sports car is not fit to drive slowly, as it did in the Lamborghini Aventador LP700-4 Roadster is breaking down due to overheated engine, the Aventador car even produce smoke that much of the hood. Lamborghini Aventador is the Italian car with a 6.5 liter V12 engine, the engine of that size; the air conditioning was not enough to stabilize the engine heat only when driving slowly, due to the lack of supply of air to cool the engine. "Article : Lamborghini Aventador broke down when engine overheats"